Burning Gold Candles with triple fragrance, 30 hour burn time. AROMATIC ZEST – Fresh, fruit notes of pink peppers and redcurrant. Essence of rose, jasmine and peony with background scents of musk and vanilla. COTTON CREAM – Heady sandalwood and delicate mandarin blossom, combined with soft apricot, white hyacinth, sweet pea, jasmine and ylang ylang. FRESH DEW – Sensual tuberose, honeysuckle, oriental jasmine and combines with a musky, silky base of crystal amber and sandalwood. GRANDIFLORA – Highlights of oriental cassis, green notes and a warm centre of freesia, may rose and lily. Cedar, sandalwood, amber, sugar and vanilla. HERB GARDEN – The essence of blush pear, soft melon, fressia, precious rose and delicate lily, with a patchuoli, musk and amber base. MODERN BLUSH – Aromatic amber with salty sea notes. Grapefruit and mandarin with hints of jasmine, laurel, bay and vetiver, patchuoli, oakmoss and resin. 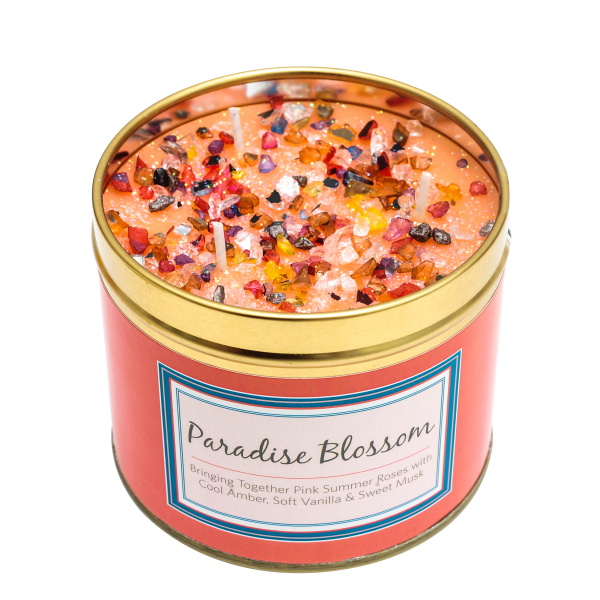 PARADISE BLOSSOM – Aqua blossom and pink summer rose, with cyclamen, cool amber, soft vanilla and sweet musk. 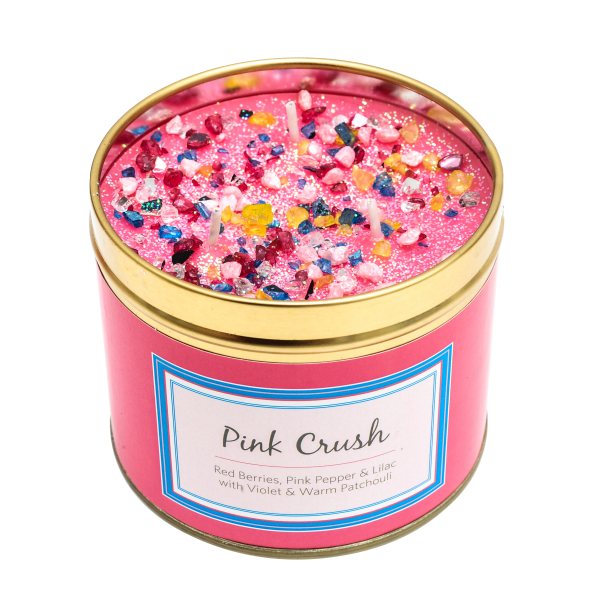 PINK CRUSH – A rich spicy indulgent fragrance of red berries, pink pepper, lilac, violet, raspberry, peach and warm patchuoli. 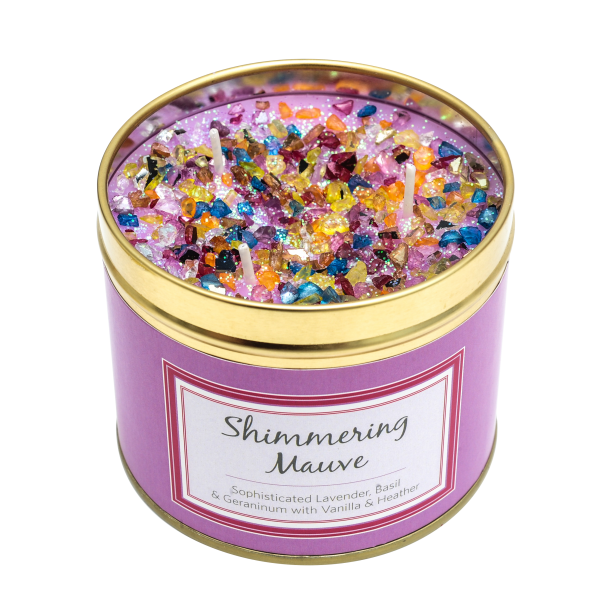 SHIMMERING MAUVE – Sophisticated woody notes with soft hints of herbal lavander. This is enriched by fresh basil, heather, geranium, vanilla and ferns. 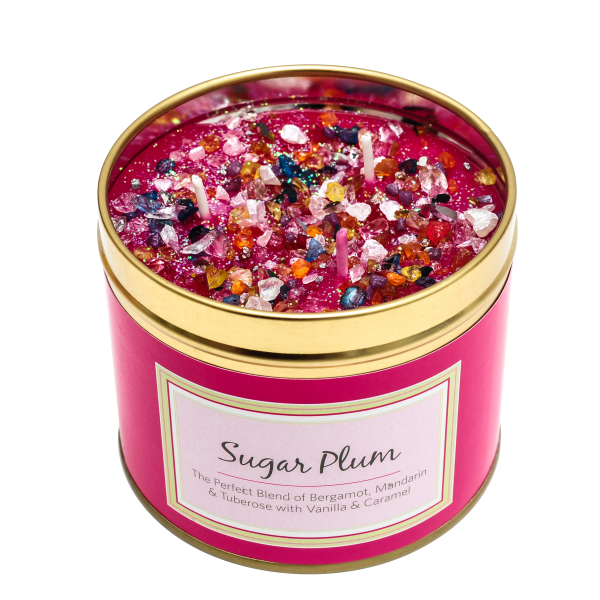 SUGAR PLUM – The perfect citrus blend of bergamot, lychee, mandarin and tuberose. There are also base notes of caramel, vanilla, sandalwood and musk. SUNSET HARMONY – Rejuvenating lemongrass, lemon, lime and crushed basil. Touches of lavender, geranium, peppermint, clove and warm cedar. SUNSHINE GLOW – A rich, fruity fragrance of cassis and raspberries with leafy green notes. A heart of magnolia and lily of the valley with notes of wood and musk.